The engine cooling system is pressurized, particularly when the engine is warm. When opening the cap, you could be scalded by hot coolant spraying out. There is a risk of injury. Let the engine cool down before opening the cap. Wear eye and hand protection when opening the cap. Open the cap slowly half a turn to allow pressure to escape. ■ Park the vehicle on a level surface. Only check the coolant level when the vehicle is on a level surface and the engine has cooled down. On vehicles with KEYLESS-GO, press the Start/Stop button twice . ■ Check the coolant temperature gauge in the multifunction display. ■ Turn the SmartKey to position 0 in the ignition lock. ■ Slowly turn cap 1 half a turn counterclockwise to allow excess pressure to escape. ■ Turn cap 1 further counter-clockwise and remove it. If the coolant is at the level of marker bar 3 in the filler neck when cold, there is enough coolant in coolant expansion tank 2. If the coolant level is approximately 0.6 in (1.5 cm) above marker bar 3 in the fuel filler neck when warm, there is enough coolant in expansion tank 2. ■ If necessary, add coolant that has been tested and approved by Mercedes-Benz. ■ Replace cap 1 and turn it clockwise as far as it will go. For further information on coolant, see . ■ To open: pull cap 1 upwards by the tab. ■ Add the premixed washer fluid. ■ To close: press cap 1 onto the filler neck until it engages. 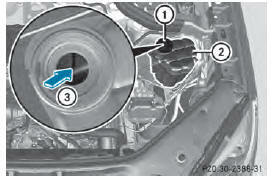 The washer fluid reservoir is used for both the windshield washer system and the headlamp cleaning system. Further information on windshield washer fluid/antifreeze .